These steps will guide you through setting up the Single Sign-On functionality between OneLogin and Remedyforce. 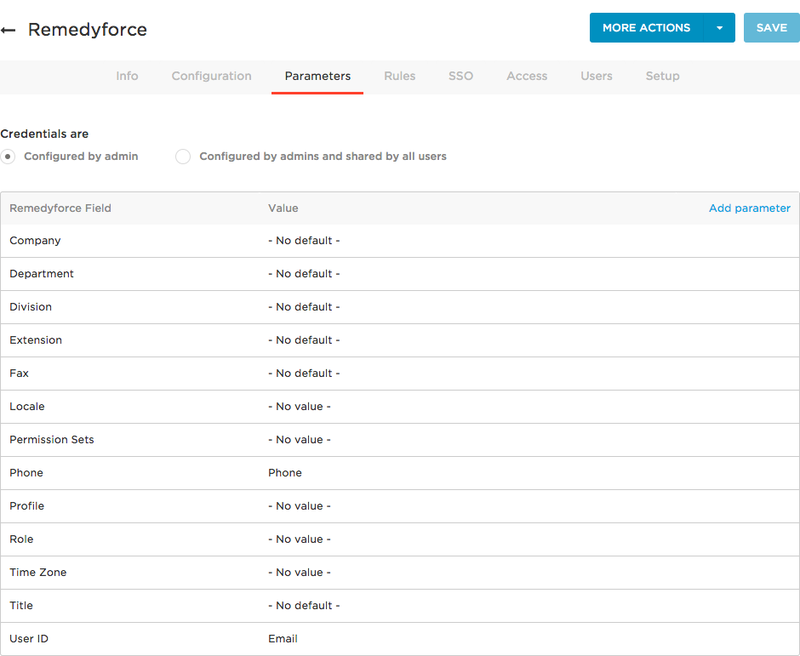 Search for Remedyforce that is a SAML 2.0 connector and select it. You may edit the Display Name if desired. Under Salesforce Organization ID, put the the entirety of your Salesforce Organization ID. If you are unsure of your Salesforce Organization ID, go to to Company Profile > Company Information within Salesforce to find it. Your organization may have custom fields enabled for your users, and if so, they may be mapped here to value fields within RemedyForce. Copy down the SAML2.0 Endpoint (HTTP) URL. Copy down the Issuer URL. Select X.509 as the certificate type. Click Download to acquire the X.509 .pem certificate. The SAML Endpoint, Issuer URL, and X.509 Certificate will be put into Remedyforce to confirm the SAML SSO connection. In the Administer menu, go to Security Controls > Single Sign-On Settings. Go to Settings > Security > Single Sign-On (SSO). 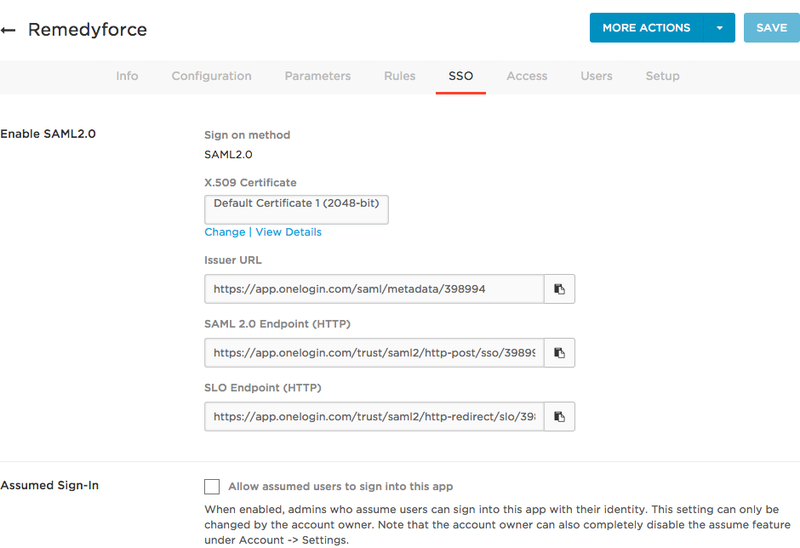 Under Federated Single Sign-On, select SAML Enabled. Select New to create a Remedyforce SSO profile. 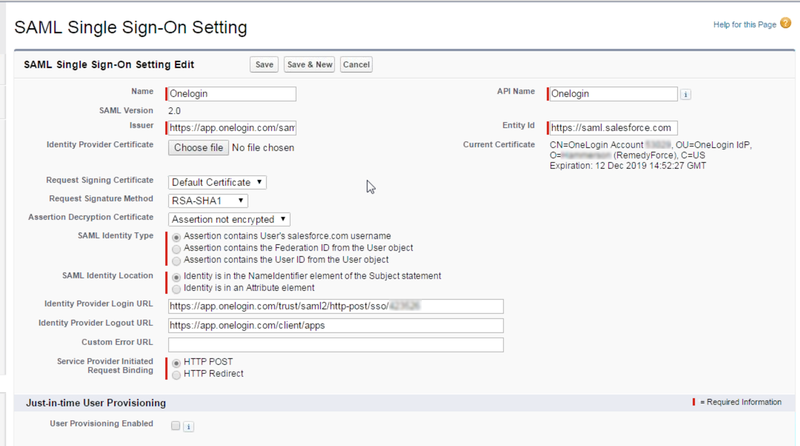 With the configuration complete, OneLogin and Remedyforce should be connected through SAML! Go to Users > Account_Owner. Select Salesforce to open the Edit Login pane. Here you may overwrite the default fields for your Remedyforce login and insert the correct information to match your OneLogin credentials with your Remedyforce credentials.